This might just be the best-dressed turkey sandwich you ever make. Served on focaccia bread with a medley of Italian-style vegetables and deli-sliced turkey breast, this stacked sandwich is a real crowd-pleaser. Layer half the turkey, vegetable mixture and remaining turkey on bottom half of bread; cover with cheese and top of bread. 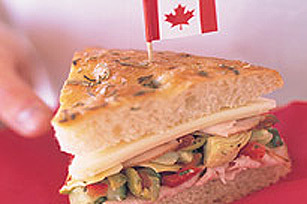 To avoid a soggy sandwich, pack the pre-made vegetable mixture, turkey, cheese and bread in separate containers and transport them to the picnic in a cooler. Use to assemble sandwich just before serving.